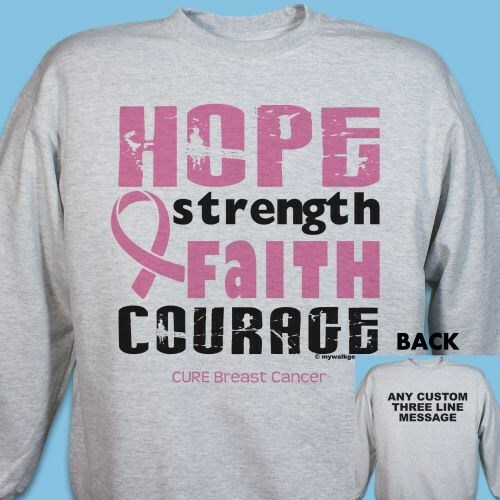 Give a strong message of hope, strength, faith and courage to anyone fighting the battle with breast cancer when you wear this breast cancer awareness sweatshirt at your next walk. You can stay warm, cozy, and comfortable while spreading awareness in this heartfelt piece of apparel. This heartfelt and inspirational design is featured on our cotton/poly blend sweatshirts, machine washable in youth sizes XS-L and adult sizes S-3XL. Free personalization of any three line custom message is included on the back of the Sweatshirt. Additional Info This piece of breast cancer awareness apparel will be a great staple to have at your next fundraising walk! Not only will it keep you comfortable and warm, but it will also send a positive message of hope for a cure. Our Breast Cancer Awareness Hooded Sweatshirt is another great option.